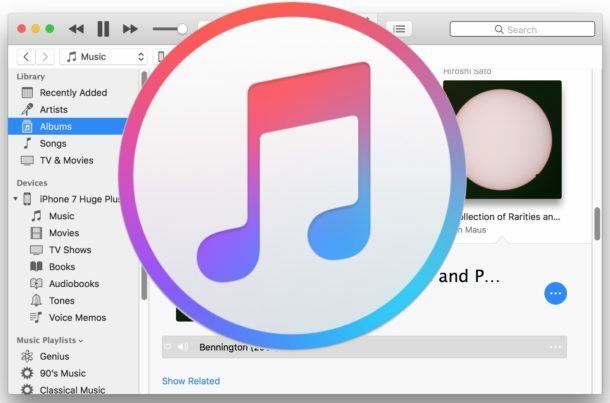 iTunes for Mac and Windows has a feature which allows music to shuffle between songs in a library, and sometimes iTunes appears to automatically shuffle songs in a music library whether the user intended to enable the feature or not. Often this is because a user has selected to enable the shuffle option intentionally but forgot about it, but sometimes shuffle my be turned on accidentally or inadvertently. Additionally, some iTunes users occasionally report that their music will seemingly shuffle and skip between songs randomly as well. If you want to disable music shuffling in iTunes in Mac OS or Windows, you can easily do so using a few different methods. One approach is to look for the little shuffle button which toggles the feature off and on, it looks the same in iTunes on a computer as it does in iOS. Another approach is to disable the shuffle feature through menu options. This should completely turn off shuffling of music in iTunes on Mac OS or Windows. Note that if you turn shuffling to OFF and the music continues to shuffle, you will likely want to turn shuffle on, start playing music, then turn shuffle OFF again, and that should resolve it. It’s likely iTunes version dependent, but some users have reported off and on that shuffle seems to either turn itself on, or is stubbornly persistent even if toggled off. Of course, user error or misunderstanding how shuffle works is also a possible explanation, particularly for those who are not familiar with the shuffle button icon which exists in iTunes, and is fairly easy to toggle on unintentionally. That’s another way to turn off and on shuffling, which we’ll get to next. Another approach to disable shuffling of iTunes music is to toggle the button switch. The shuffle button in iTunes looks the same as it does on iPhone and iPad, so if you’re familiar with shuffling music in iOS 11 and iOS 10, or disabling shuffling in iOS, then you likely know what button to look for. The shuffle button looks like two intersecting arrows. Some people may disable Shuffle in iTunes because they want to play through a track list as it appears in iTunes library, or because they want to stay on one particular album. If you’re disabling shuffle for the latter reason, another helpful tip for shuffling in iTunes involves joining songs together as a compilation in iTunes so that they shuffle together, which works great for shuffling within albums or within artists with broad libraries. This may seem like a simple or obvious trick, but many users are not aware of how shuffling works or may not be aware that they enabled it accidentally, usually by clicking the little arrow shuffle button. 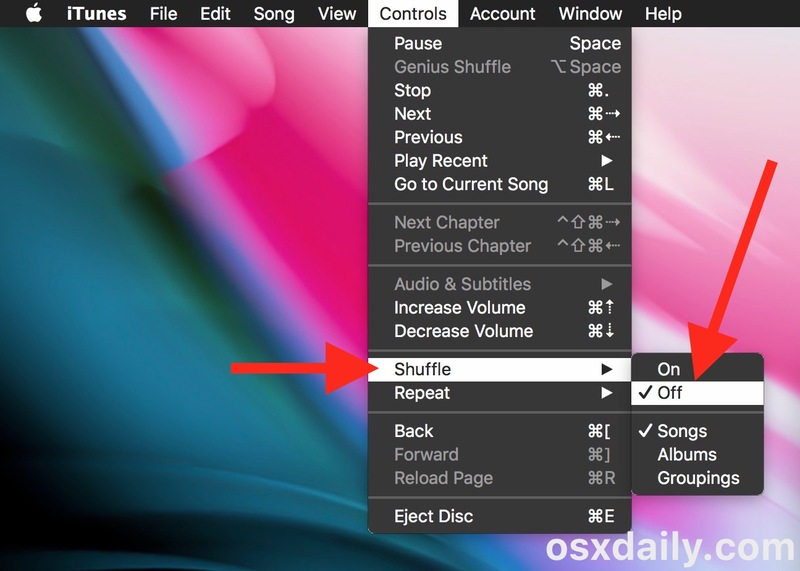 Of course enabling shuffling is just as easy as selecting the “ON” option in the Shuffle menu, or by clicking on the shuffle button and leaving it highlighted. Use the setting as you want and as you enjoy your music library.